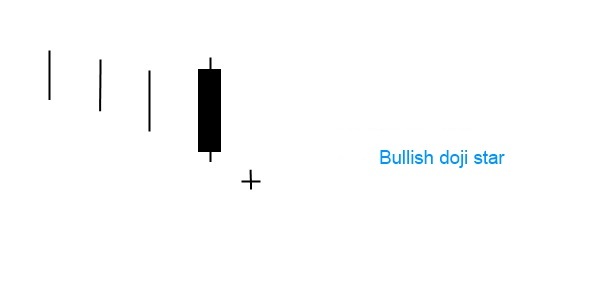 The bullish doji star is a double candlestick formation that is viewed as a bullish reversal pattern. It forms in a downtrend. The first candle is a long black candle, then a doji follows that gaps lower. The first day is a long black day, the next day opens lower with a gap down, and the trading is in a small range. Sellers are losing control and a standoff evolves between buyers and sellers. The standoff can be a result of decaying selling force or an increase in the buying temper. This pattern indicates that the strength of the downtrend is diminishing and a reversal may take place. The bullish doji star is very similar to the bullish inverted hammer.